Drs. Mark Freedman, Jeremy Grimshaw and David Moher were recently ranked among the world’s top 3,300 “most influential scientific minds”. This puts them in the top 0.05 percent of the estimated 7.8 million full-time researchers worldwide. The list, compiled by Clarivate Analytix, is based on analyzing how often a given research paper is cited or referenced by other research papers. A large number of citations means a paper has had a great influence. Clarivate tracked researcher papers over 11 years in 21 fields of science. Dr. Freedman was recognized in neuroscience, while Dr. Grimshaw was recognized in social sciences. Dr. Moher was recognized in both clinical medicine and social sciences. Drs. 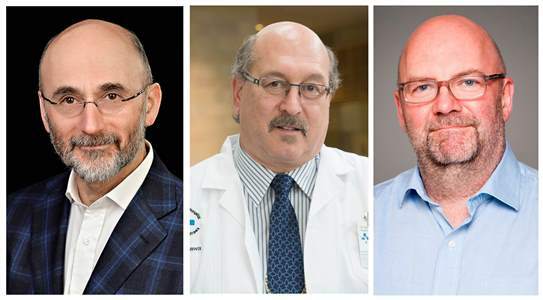 Freedman, Grimshaw and Moher are all senior scientists at The Ottawa Hospital and professors at uOttawa. Together with a uOttawa chemist who passed away in 2009, they are the only Ottawa-based scientists on the 2017 list.